In my previous blog, Four Benefits of Self-Help Books, I described how self-help literature may help readers by providing easy interventions, using accessible language to explain scientific data, helping readers recognize that they are not alone, and offering inspiration. However, there are pitfalls of self-help literature of which every potential reader should be aware. They Are One Size Fits All. Self-help books are written for a general audience, and as a result they often make generalizations when giving advice or providing interventions. While an intervention may work for one reader, it may not work for everyone. For example, a self-help book about anxiety management may encourage its readers to listen to certain sounds in order to calm anxiety. But what if you experience the world more through visual or tactical experience? If so, you may be unlikely to benefit from an auditory intervention. Before selecting a book, be sure to look over the interventions provided and evaluate if they make sense for you and your specific needs. They Cannot Diagnose You. Self-help books do not only make generalizations about intervention strategies; they often generalize when it comes to symptoms as well. Readers might believe that based upon general descriptions in a book they can diagnose themselves. However, common symptoms do not equate a diagnosis—especially when it comes to medical and psychological issues. For example, a description of some common anxiety disorder symptoms may read similarly to a description of the effects of substance use or some other medical issue. There are many factors to be considered when diagnosing a patient, and it’s impossible to conduct an objective assessment when diagnosing yourself. If you are seeking a diagnosis, it is always important to consult a professional. They May Use Misleading Marketing Tactics. Many self-help authors and publishers produce books with the intention of helping people. It is important to remember, however, that their main goal is to sell books. Dr. Gerald M. Rosen, author of “Don’t Be Afraid: A Program for Overcoming Your Fears and Phobias,” reported that the jacket of his book reads, “In as little as six to eight weeks, without the expense of professional counseling, and in the privacy of your own home, you can learn to master those situations that now make you nervous or afraid.” Rosen reported that the jacket did not mention that only “50 percent of people succeed at self-administered treatment.” Misleading marketing tactics may be difficult to spot, so it’s a good idea to examine reviews and gauge the experiences of other readers for yourself. They Are Not a Substitute for Professional Services. Some self-help books claim that you can be cured from a medical or psychological illness, avoid bankruptcy, or represent yourself in legal matters without the involvement of a professional. They may be right in some cases, but they also may be wrong in others. Not every reader’s situation is the same, and some readers may need professional services. For example, a person with a simple legal issue might successfully represent themselves without hiring an attorney. They might gain enough knowledge through the reading of self-help literature alone. However, a person facing a more serious legal issue is likely to require the assistance of a qualified attorney. Be leery of self-help literature that strongly encourages you to avoid seeking professional services. If you are participating in professional services, it is also a good strategy to ask your hired professional if they have any self-help literature recommendations. Many professionals, especially mental health and medical providers, love to provide book recommendations as literature could increase the likelihood that treatment is successful. 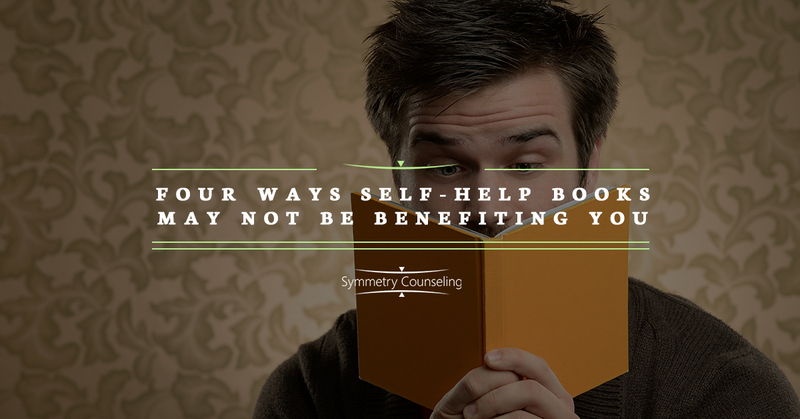 There are both benefits and downsides to self-help books. If you’re aware of the limitations, you may be more likely to receive the potential benefits. In addition to reading self-help books, you might also benefit from participating in therapy. Contact Symmetry Counseling today to schedule an appointment. Gerald M. Rosen, G.M. (1993). Self-Help or Hype? Comments on Psychology’s Failure to Advance Self-Care. Professional Psychology: Research and Practice, 24(3). 340-345.